Yesterday we strolled around London for the second location of City As Material 2, accompanied by the same gang as Thetford: Andrew Hunter and Lisa Hirmer of Dodolab, Josie Mills from the University of Lethbridge Art Gallery and Leila Armstrong. We followed in the wake of Professor Starling as he continued his investigations in the UK, looking at several key sites of historical significance to Starlings. Outside the British Museum was first, where we received hails of giggles from startled tourists and smirks from Londoners passing by. 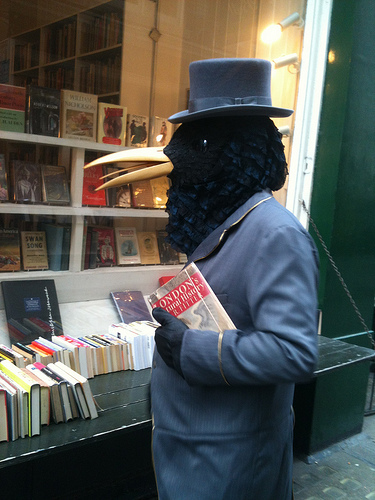 It was surprising that Professor Starling got so many reactions in London, where there’s plenty of street performers and PR stunts, compared to low-key Thetford. People that did engage with us seemed to be more concerned with the spectacle of the costume than talking about the awareness of Starlings and other birds. This was especially the case when we got to Trafalgar square, after checking out the second-hand book and print shops on Cecil Court, the Professor briefly mourning some of his stuffed kin in the window of an antiques shop. A descent of the steps leading down to the Mall was next. They were curiously empty, lending a very regal air to the Professor as he grandly strode on, cane in hand, towards St Jame’s Park. Circling the lake amongst the many species of waterfowl, eagerly scrabbling at morsels of tossed bread through the fence, we overheard questionable tales of Starling murmurations in fantastical formations, and laments for the decreasing number of small birds in the parks and other public spaces. Shedding his feathers and back in human form, Andrew and the rest of the team accompanied us to Gaby’s Deli on Charing Cross Road for lunch. It’s currently being threatened with closure by the landlords, after more than 50 years of service behind it – here’s hoping it doesn’t migrate elsewhere. Tomorrow we’ll be in Oxford, the final spot of the series.